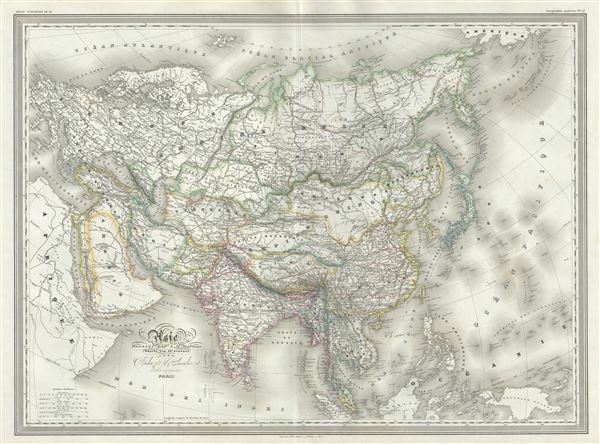 This is a beautiful large format 1860 elephant folio map of Asia by A. H. Dufour. It covers the entire continent from the Mediterranean to Siberia and from the Arctic to Singapore including parts of Europe and Africa. Both the Great Wall of China and the Grand Canal are noted. This map was prepared by Auguste-Henri Dufour and engraved by Charles Dyonette for publication plate no. 32 in Armand Le Chevalier's 1860 edition of Atlas Universel, Physique, Historique et Politique de Geographie Ancienne et Moderne.